Winter is the season of snow, ice, cold -- and carbon monoxide poisoning! Clear, odorless carbon monoxide gas (CO) is a product of incomplete combustion. The Canada Safety Council estimates that 200 Canadians are killed by this gas every year, and more than 1,500 others exposed to CO require medical attention. A majority of CO victims succumbed to the fumes while in stationary vehicles with engines running. Poor maintenance, obstructed tailpipes and alcohol consumption are common factors in vehicular CO fatalities. Carbon monoxide poisoning is also a threat in the home. Clogged air intakes for furnaces or water heaters and plugged chimneys can lead to gas buildup. Propane refrigerators and burning charcoal can also release dangerous amounts of CO.
All vehicles should be well maintained. Exhaust systems should be checked regularly for holes, loose connections, or leaks. A vehicle's body should be sound and free of holes through which gas could enter. And remember, well-tuned engines produce far less deadly CO gas. Drinking and driving is a serious offense! Parking with the engine running while 'under the influence' greatly increases potential for CO poisoning. Never sleep in a parked vehicle with the engine running. If you're stranded and know you are likely to doze off, turn the engine off. You'll wake up when it gets cold enough, and can then run the engine for a few minutes to warm up. When parked were drifting snow may start to cover the tailpipe, or when stuck in a ditch or snowbank, check frequently to ensure that exhaust gases can escape easily. Always leave a window open slightly to let in fresh air. Such ventilation is a good idea when you are driving, and not just while parked. Be alert for early warning signs of CO poisoning, which include headache and dizziness, slight nausea, confusion, and drowsiness. If you feel any of these symptoms, get out of the vehicle and into the fresh air until you recover. Never leave children in vehicle while the engine is running, even when you're just "going into the store for a minute". Never leave engines running in a confined space -- such as a garage or workshop -- without proper venting. Only qualified, licensed service personnel should install and inspect fuel-burning appliances, or convert such equipment from one type of fuel to another. All fuel-burning appliances should receive an annual safety inspection. The 'check-up' should include intake lines, flue pipes, chimneys, etc. Never use barbecues or other charcoal burning devices indoors, because they release dangerous amounts of CO! Never leave a vehicle idling in a garage which is attached to or located beneath a home. Exhaust gases can enter the living quarters, whether or not there are connecting doors. 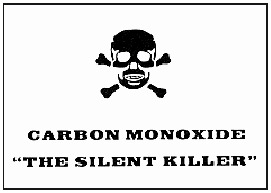 Please take extra care to prevent carbon monoxide poisoning. CO is a silent killer, and chances of exposure greatly increase as we seek warmth during the winter months. Low concentrations of CO can lead to a slight headache and shortness of breath upon moderate exertion. Higher concentrations can produce a severe headache, confusion and dizziness, impaired vision and hearing, and collapse or fainting with exertion. Extreme concentrations can lead to unconsciousness or death! Move to fresh air immediately at the first indication of any of the above symptoms. If it is necessary to move an unconscious victim to the outdoors, be extremely cautious before entering an enclosed area where CO concentrations may be high. Open doors and windows for maximum ventilation. Keep the patient lying down and wrapped in blankets to maintain body warmth until emergency help arrives. Rest is absolutely essential. Under no circumstances should the patient be allowed to walk after regaining consciousness. They should rest for at least two hours, if possible. In all cases where breathing has ceased, artificial respiration must be applied immediately. A knowledge of some efficient method of resuscitation is vital.